ShadowBet Casino came into existence in 2016 and it is under the management of MT Secure Trade Limited Casinos. Although not popular like other established platforms, you will be lost with choice when you access their game lobby. The casino operates under the license from Malta, UK, and Curacao, and secured with SSL encryption. All games offered are packed with stunning graphics and special winning features. ShadowBet Casino has a simple platform where players can access games instantly on their gaming devices. All the game suppliers are reputable in the gambling world and they include popular brands in the industry like Betsoft, NetEnt, Play’N Go, WMS, Yggdrasil and Evolution Gaming. In addition, the games are developed with the latest technology of HTML5 enabling them to run on major mobile devices including iOS, Android, Windows, and Blackberry. As an instant play platform, players can access through standard browsers like Chrome, Firefox, Safari, Opera and Microsoft Edge. Table Games: Joker Poker, Double Bonus Poker, French Roulette, Baccarat, French Roulette, Blackjack Single Deck, Pontoon, and Tens or Better. Progressive Jackpot: Charms and Clovers, Tycoons, At The Copa, It Came from Venus, Gun Slinger and Arabian Nights. Live Dealer Games: Ultimate Texas Hold Em, Blackjack Live, Baccarat Live, Dragonora Roulette, Speed Baccarat, and Roulette. 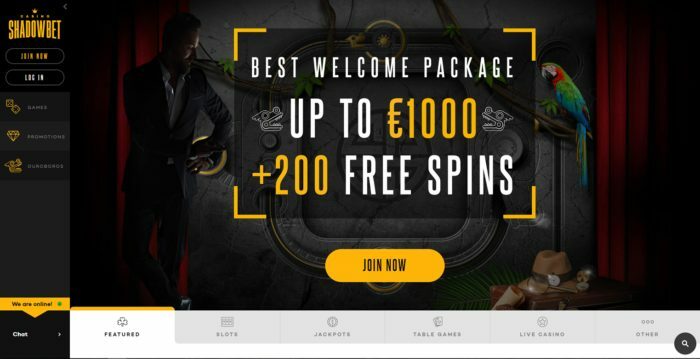 ShadowBet Casino offers all new players joining their site welcome bonuses among other promotional offers. The welcome bonus package is available in three stages including 100%, 50% and 25% on the first, second and third deposits. As well, there is a VIP program and promotions like spins, reload bonus and free money. To ensure that players are able to deposit or withdraw their funds safely and swiftly, ShadowBet Casino offers a number of banking options such as Visa, Mastercard, Neteller, Skrill, Paysafecard, and Trustly. There is a 24/7 support team where you can present your questions via live chat, email, and phone.